Almost two decades since D.O.N.S. first hit the dance charts with their club track ‘Pump Up The Jam’, the German DJ/producer behind some big productions has taken one of his very own weapons from 2005 and given it an upgrade ready for the dance floors of 2014. 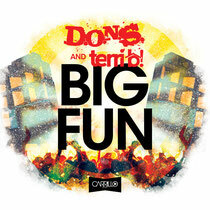 Landing on Carrillo Music, ‘Big Fun’ once again features the vocals of popular vocalist Terri B. while D.O.N.S.’ production skills are laid bare. With a deep house sound that’s loaded with old skool groove, the track does exactly what it says on the tin and should get the dancefloor rocking. A full release package with remixes from Dennis Ramoon, Hansol & Billy Sizemore, Markus Greg & Field, Maurizio Inzaghi, Mike Newman & Gussy Dub and Steve Valentine’s Clubwhores, Carrillo should have every possible angle covered. As one half of the Warp Brothers, who are also making their comeback, D.O.N.S. has been on an successful musical journey and doesn’t look like he’s slowing down anytime soon. It’s out now, check it out below.